Campeggio Le Médiéval si trova a Saint-Thomé, Ardèche, è situato fiume/torrente. Questo campeggio dispone di piazzole delimitate, sia ombreggiate che e piazzole poco ombreggiate. È possibile affittare tende, casemobili e appartamenti. Ogni anno un ispettore visita il Campeggio Le Médiéval, controllando oltre 200 tra attrezzature e altri punti di interesse del campeggio. L'ispettore è un dipendente ACSI e non lavora per il campeggio. This is the worst run campsite in the whole of France. The pitches are reminiscent of the rubbish left after a builder has dumped his rubble. The toilets /shower block although newish are never cleaned. The food delivered by the restaurant is nothing but awful with way over priced wine. The owner is nothing but a spoilt madam who seems she can do as she pleases. Whilst we were there they had a wedding which caused terrible noise from the disco from 18:30 to 03:30 the next morning. The owner allowed category 1 dogs to roam the site making it dangerous for both people and other pets. To make matters worse the madam refused to accept my payment for both a meal and the pitch dues. I would advise that you pitched up at any other campsite rather than this hell hole. Very calm and pleasant site in Sept/Oct 2014, with a visiting stork for added interest. 5 mins walk into the little pretty town of Turckheim, and a wide range of walking through vineyards to other wine villages. We found the sanitary block excellent - but do not put anything into the washbasin in the shower cubicle as the taps are automatic. Result - very soggy washbag! We would definitely use this site again - the reception was pleasant and helpful, and they did ask us if we wanted an exit key [see other English review]. A great base for walkers and wine buffs. We'll be making a return visit. Volete prenotare il campeggio Campeggio Le Médiéval o oppure saperne di più? Potete farlo usando i seguenti dati oppure tramite il sito del campeggio. A7 uscita Montélimar-Sud/Viviers. Dopo 1 km su N7 per Montélimar, prendere D126/D73 per Viviers, poi N86 verso Le Teil. Dopo 6 km D107 verso St. Thomé. Il campeggio è a sinistra. 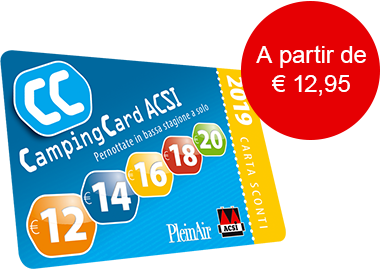 ACSI Eurocampings invia la tua richiesta di informazioni al "Campeggio Le Médiéval".